Rosenfeld Kidson has the most comprehensive range of environmentally certified hardwood decking timbers available in New Zealand. This range of premium quality hardwoods offers solutions to any commercial, public or residential situation. New Zealander’s have a great appreciation for timber decking, and Rosenfeld Kidson are the country’s leading supplier of decking hardwood. Our premium hardwood timber species have been selected to provide the most beautiful, stable and durable decking material available. These alternatives of Garapa, Vitex, Kwila and Tonka provide a range of attractive hard wearing options for external timber decking. These hardwood decking species are available in a large range of sizes and finishes, and our experienced staff are here to advise the best timber options for your decking project. All decking timber is air-dired or kiln-dried. Please refer to our Premium Exterior Hardwoods brochure for hardwood decking installation. Our decking hardwoods range in colour from pale cream (Vitex and Yellow Cedar), honey-brown to medium brown (Garapa and Tonka) through to dark red-brown (Massa, Jarrah and Kwila). All hardwood decking timber will weather to a silver grey if left to do so. The timber of some decking woods, like Kwila, will leach a dark coloured stain when wet. All decking is available with an optional coat of FactoryOil on all four faces prior to delivery. This is available as either a clear coat or with a naturally coloured pigment to allow the timber colour to be maintained. Spread of lengths available and all supplied in random lengths (excl. finger-jointed). Lengths can vary, with most averaging between 2.7 to 3.0m, and up to 5.7m for finger-jointed kwila. Species such as Garapa, Jarrah, Massa, Tonka, Saligna and Alaskan Yellow Cedar are from well managed and legal resources, most of which are independently certified as such. All imported Kwila carries third-party independently audited VLO (Verified Legal Origin) certification. See our Sourcing Policy. 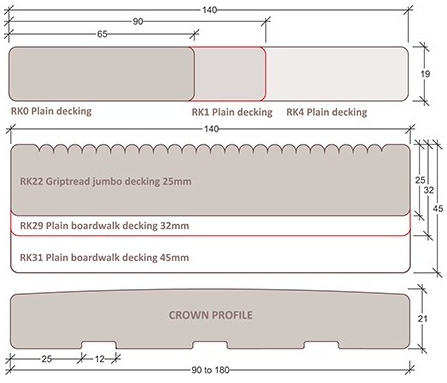 Discuss the most suitable timber for your deck and ask our sales team for pricing. We can recommend the best FSC® or alternatively certified timber for your decking. Contact us.